She Persisted Around the World: 13 Women Who Changed History written by Chelsea Clinton and illustrated by Alexandra Boiger is an introduction to thirteen scientists, artists, activists and thinkers who have advanced knowledge and made the world a better place. This celebration of women from diverse cultures includes New Zealand’s Kate Sheppard who successfully led the fight to give all women the right to vote making New Zealand the first country to do so in 1893, Wangari Maathai from East and Central Africa who was the first African woman to win the Nobel Peace Prize for her work that was responsible for the planting of more than 50 million trees and for demanding rights for all individuals, Malala Yousafzai from Pakistan who works for girls’ rights to go to school and who is the youngest person to win the Nobel Peace Prize and Poland’s Marie Curie who won the Nobel Prize twice, once in Physics and once in Chemistry, to name just a few. 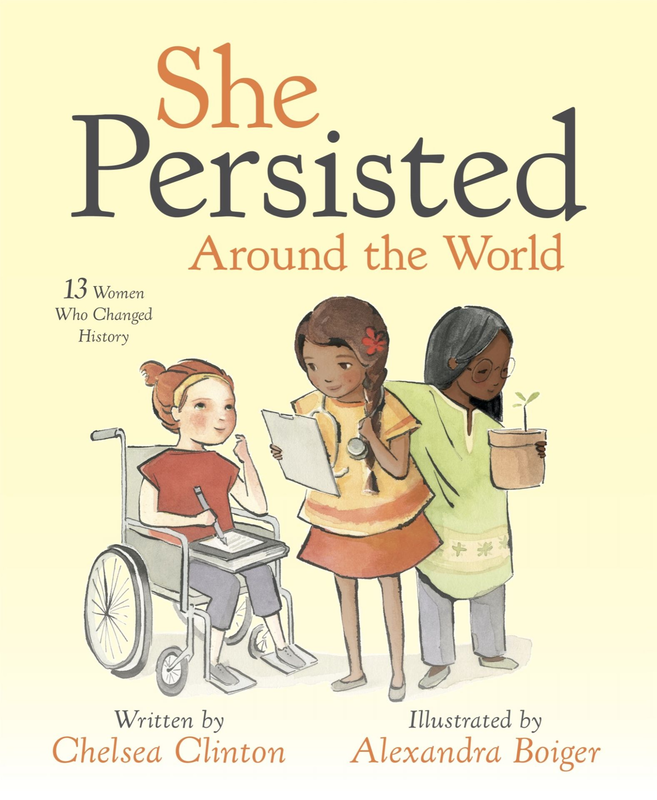 She Persisted Around the World: 13 Women Who Changed History written by Chelsea Clinton and illustrated by Alexandra Boiger is compiled and designed perfectly for young readers 5-8 years of age (Philomel Books/ Penguin Young Readers Group, 2018). In this book, J.K. Rowling’s quotation says, “We do not need magic to transform our world; we carry all the power we need inside ourselves already.” What do you think this means? What powers do you have inside yourself? Could courage, creativity and imagination have anything to do with transforming the world? Think about it. Discuss it with your parents. Then draw a picture of the power you have inside yourself. Which woman of the thirteen featured in this book would you like to read more about? Why? Ask your teacher for help in finding more materials and articles on that woman. After reading more about her write a paragraph that tells us even more about that woman’s life. Read this book again. What could ballerina Yuan Yuan Tan and writer J.K. Rowling have in common? What do Juana Inés and Malala Yousafzai have in common? The following quotation belongs to which woman? “Nothing in life is to be feared, it is only to be understood.” What does this quote mean to you? Which quotation in this book is your favorite? Why?